Although many visitors come to Rome to enjoy its many churches, museums, restaurants, theatres and other indoor attractions, Rome is very much an outdoor city. 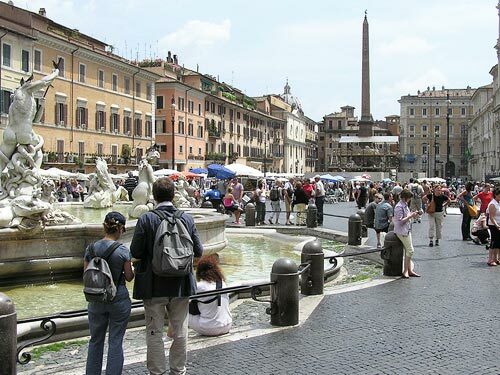 Many of its piazzi are full of local life and colour and in these squares can also be found some of its glorious monuments, Piazza Navona being one of these. Piazza Navona was constructed on the site of one of the ancient circuses (Circus Agonalis) where the ancient Romans came to watch the agones (games). It is believed that the circus name changed to ‘in agone’ and over time it became Navona. A piazza is a public space and Rome’s piazzas are truly gathering places for people who love the beauty of outdoor art in all its forms. Piazza Navona holds one of the finest examples of Bernini’s fountain work: the Fontana dei Quattro Fiumi (Fountain of the Four Rivers), built in 1651 . The four gods on the corners of the fountain represent the four major rivers of the world known at the time as the Danube, the Ganges, the Nile and the River Plate. Arranged around the central rocky mass supporting the almost-obligatory obelisk are four large sculptures executed by his students. One of them, the Ganges, was sculpted by Claude Poussin who would later become a master under his own name. The fountain is a tour de force with a sea monster, a lion, cacti, palm tree and a dozen other pieces woven together around the central column. The funding was so large for the piece that taxes were levied on bread, prompting outcries from Roman citizens both poor and rich. But with the controversy now a part of history, visitors like us can simply enjoy it for its beauty and artistic merits. The Fountain of the Moor, at the other end of Piazza Navona, features a Triton – one of the many gods of the sea – riding a dolphin. From this vantage point, there is ample opportunity for people watching, enjoying the warm Roman sunshine or planning your next stop around the Piazza Navona and its environs. There are dozens of merchant stalls, interspersed among the many cafes and restaurants. You could stop near one and have your portrait sketched by one of the numerous artists dotting the piazza. They may not be grandmasters, but some of them are really talented. There is nightlife until early in the morning, with mimes, artists and a hundreds of natives and tourists threading through the oval plaza. Some rave about the chocolate Tartufo at Tre Scalini, but be warned that cafes and restaurants around Piazza Navona do charge premium prices, especially if you choose to sit at one of their tables. 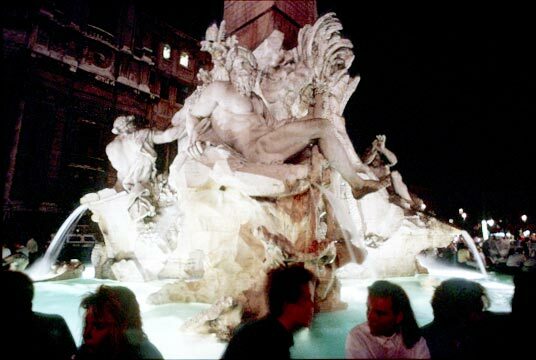 However, if budget’s not a concern and you just want to have a great time in Rome, why not enjoy a gin and tonic and take in the ambiance of Piazza Navona. The Fontana dei Calderai (Fountain of the Coppersmiths), later renamed the Fountain of Neptune is also here. Decorated with sea figures, Neptune slaying an octopus, sea horses, dolphins and Nerieds (sea nymphs) it carries Rome’s fountain-sea creature theme to the ultimate peak. The fountain is made of the same Portasanta rose marble used for St. Peter’s doorjambs. After Piazza Navona, you can take a short walk to the Piazza Sant’Eustachio, between the Pantheon and Piazza Navona to grab what many think is Rome’s best espresso in Caffè Sant’Eustachio and listen to some classical music. Or wander back to the Pantheon (it’s not far).